Pennsylvania has hundreds of beautiful waterfalls scattered throughout the entire state. However, many of these waterfalls are hidden away in public lands, far from the nearest parking area. So, what if you want to see waterfalls, but don’t like the outdoors, can’t hike, or just want to see something quickly? 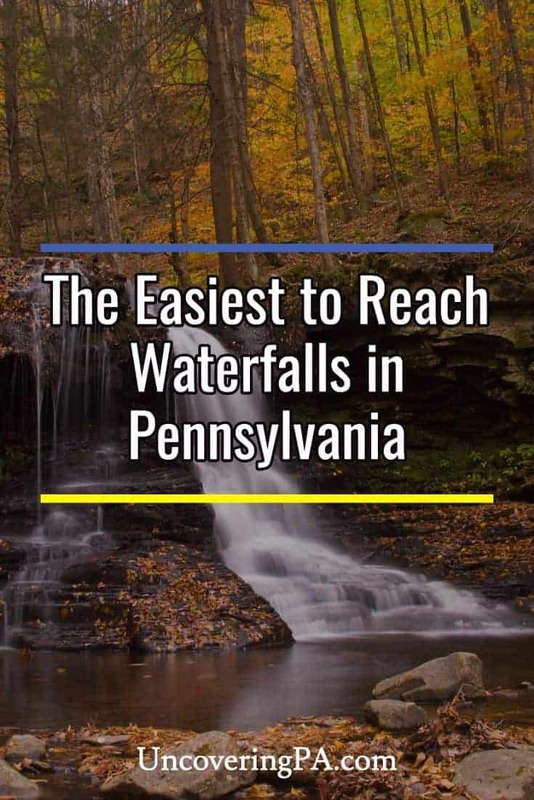 Fortunately, there are several great waterfalls in PA that are perfect for those that want a waterfall that requires little or no effort to visit. All 10 of the waterfalls listed below are either visible from the parking lot or require a short, easy walk along a very wide and established path. No matter how much you hate hiking, these easily accessible Pennsylvania waterfalls are great choices! Dry Run Falls is an impressive waterfall, and I was only standing about 100 feet from my car when I took this photo! Not only is Dry Run Falls in Loyalsock State Forest one of my favorite waterfalls, but it’s also one of the most accessible. In fact, you could view this waterfall from inside your car and not miss much. Of course, that’s not to say that it isn’t worth getting a closer look, which you can do within 50 feet of your car. If you want an even closer look, getting to the bottom of this waterfall is quite easy, though it does require a very short, but somewhat steep decent along a narrow trail. This waterfall is located deep in the forest, but since a typical car can handle the road (as long as there is no snow or ice), I’ve included it on this list. To find out more about visiting, check out my full article about how to get to Dry Run Falls. The twin waterfalls of East Park in Connellsville, Pennsylvania. 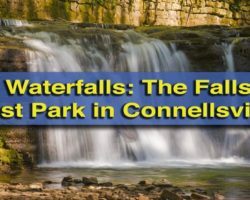 East Park in Connellsville is a bit of the radar, but offers two fantastic waterfalls that can be seen from the road. Each drop is about 8 feet in height, and they separated by about 50 feet. Those wanting to get a closer look can walk up 100 feet up the short, wide, and level path to the top of the waterfalls. 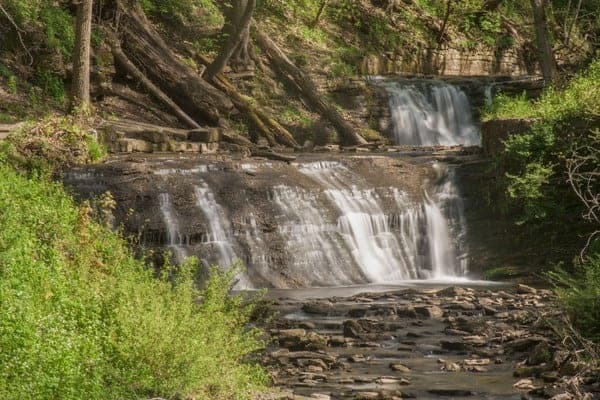 For more information on visiting them, check out our full article on the great waterfalls of East Park. Dingmans Falls is an amazing waterfall and easily accessible for those that don’t want to hike. 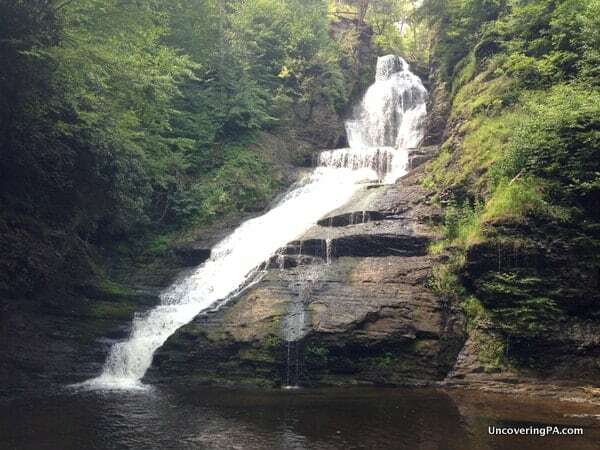 Located in the Delaware Water Gap National Recreation in the Pennsylvania Poconos, Dingmans Falls is a great one for people who love waterfalls, but hate hiking. While this one does require a few minutes of walking, it’s along a wide and flat wooden boardwalk through the woods. Even better, you’ll pass Silver Thread Falls, another easily accessible Pennsylvania waterfall on your way to Pennsylvania’s second tallest waterfall. Two waterfalls for the effort of one! What’s better for those who love waterfalls but don’t want to hike? Find out more about visiting Dingmans Falls here. Adams Falls is the easiest to reach and one of the most beautiful waterfalls in Ricketts Glen State Park. 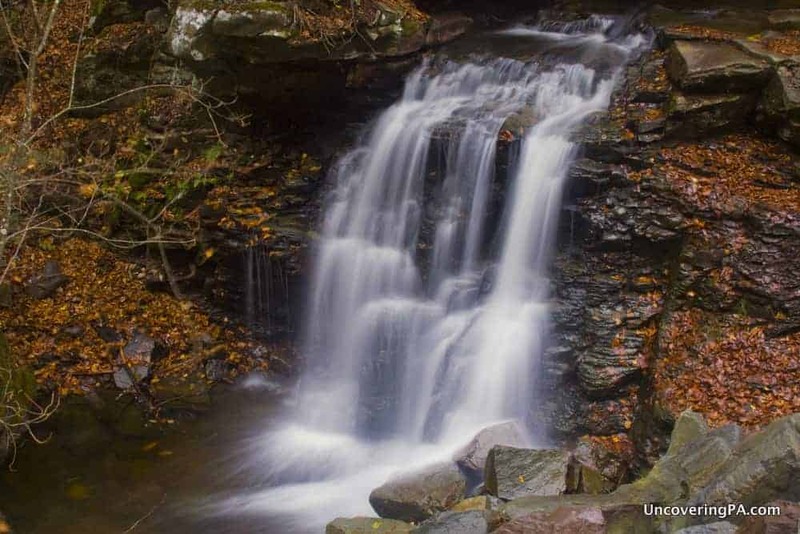 Ricketts Glen State Park in Luzerne County is home to 21 awesome waterfalls. And, while many of them are only visible to those interested in hiking the 7.2 mile-long Falls Trail, one is easily visible for almost everyone: Adams Falls. Located about 100 yards from the Evergreen Parking Lot on Route 118, Adams Falls cascades through a chute and is considered by many to be the most beautiful waterfall in the park. It does require walking along a somewhat uneven path, but the trail is wide and relatively flat, making this an easy waterfall to visit. 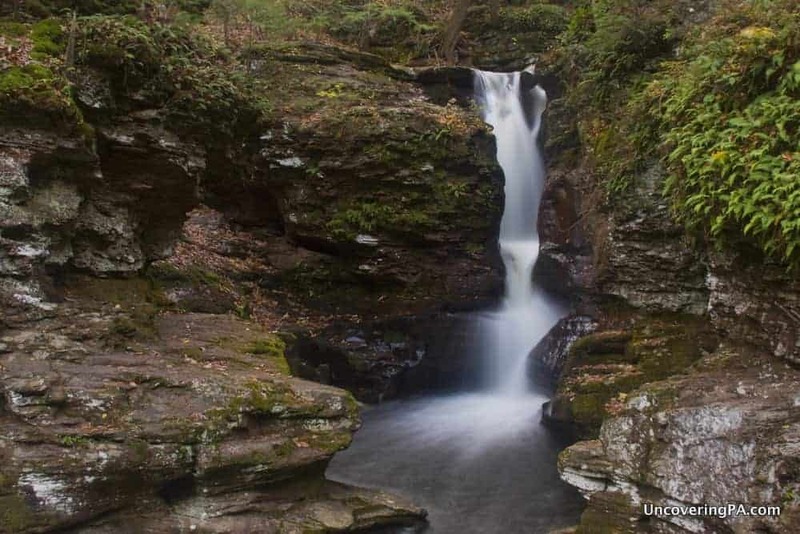 Click the link to find out more about visiting Adams Falls in Ricketts Glen State Park. Ohiopyle Falls is located right in the middle of the borough of Ohiopyle and even has viewing platforms. Ohiopyle Falls is another great option for those looking for easy-to-reach waterfalls in Pennsylvania. Located in the heart of the borough of Ohiopyle and Ohiopyle State Park, Ohiopyle Falls is located steps from a large parking area. Even better, this waterfall has a great viewing platform to see this powerful falls from. When you’re done viewing the waterfall, you can walk into the new Ohiopyle Visitor Center or head into town. 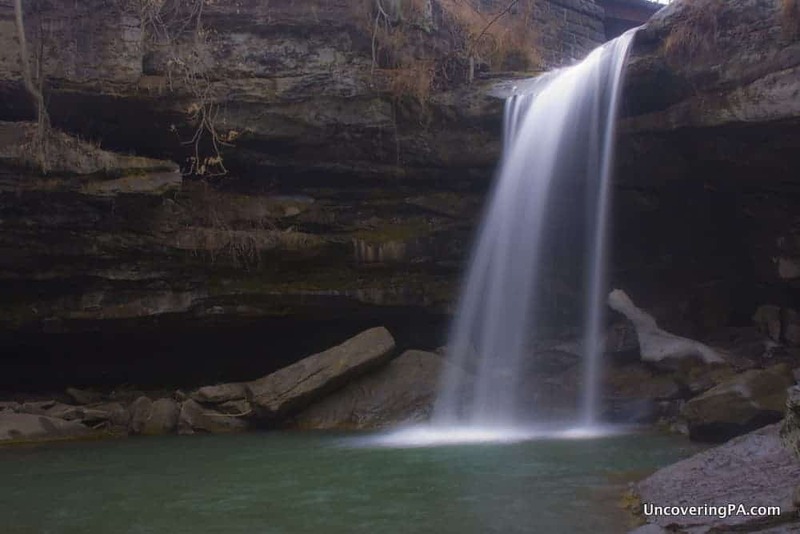 Find out more about visiting this waterfall and its amazing history in my full article about Ohiopyle Falls. Buttermilk Falls in Beaver County, PA is easy to reach and worth visiting even for those that hate hiking. 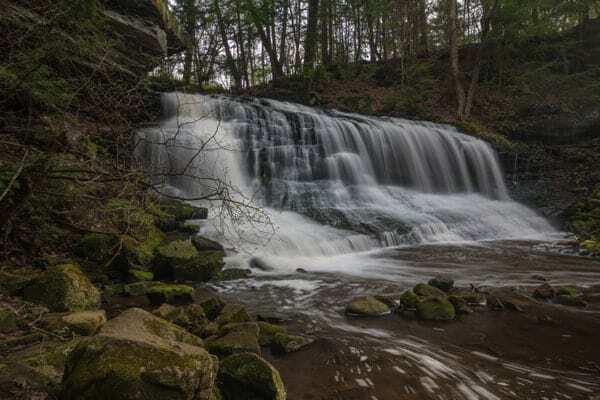 There are at least seven waterfalls in Pennsylvania known as Buttermilk Falls, however, none are easier to reach than Buttermilk Falls in Beaver County. Located just off of I-76 in western Pennsylvania, the top of Beaver Falls is located less than 100 yards from a small parking area next to a beautiful white church. The road to get up to the church is a bit rough, but isn’t too difficult in a standard car. Those wanting a closer look at the falls will have to walk about 5-7 minutes through the forest at the bottom of the hill, but even this trail is fairly easy for those that don’t like hiking. 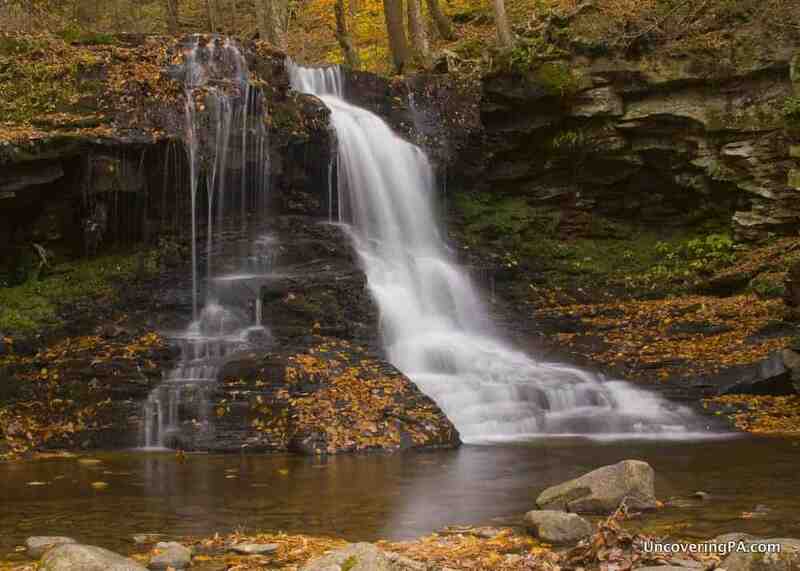 Find out more about visiting Buttermilk Falls in Beaver County by clicking the link. You will have to hike a bit to get a view like this, but you can still see Bear Run Falls and Fallingwater without much hiking. One of the most famous homes in Pennsylvania, Fallingwater, is also home to one of the most easy to view waterfalls in PA. 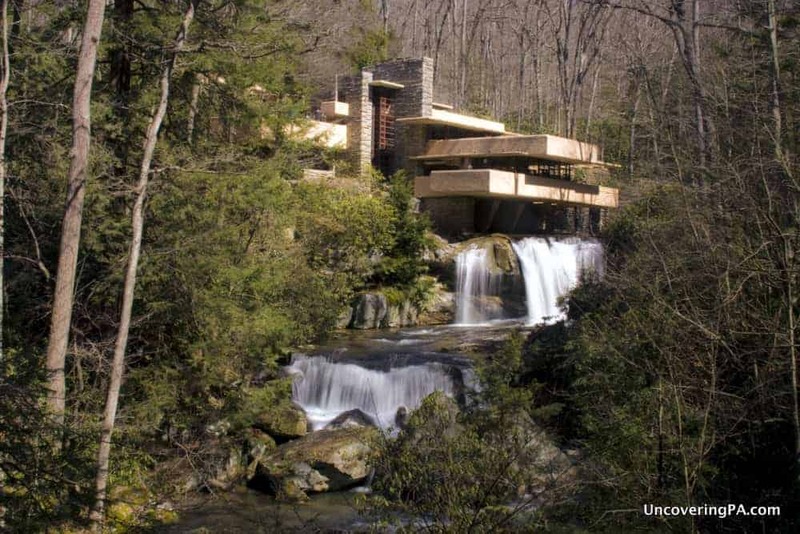 Located just down the road from Ohiopyle State Park, Fallingwater is the creation of Frank Lloyd Wright, one of America’s most famous architects. The home that he built over Bear Run Falls is known the world over for its beauty and elegance. It’s true that the view above requires a tiny amount of very worthwhile hiking, but there are still several places where you can view the falls and the home without breaking a sweat. 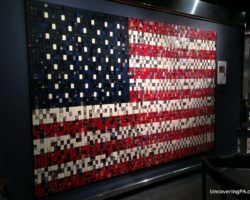 Read my full article about visiting the grounds of Fallingwater for more information about the home. Big Run Falls in Sullivan County can be seen without even leaving your car! There are more than 20 waterfalls scattered around State Game Lands 13 in Sullivan County, and many of them require very difficult hikes to reach. However, for those that don’t want to go hiking, Big Run Falls in a great choice! Located directly along Jameson City Road, the dirt road that passes through the game lands, this waterfall can be seen without even stopping your car. If you want to get a closer look, pull your car off to the side of the road and have a look at this beautiful waterfall from the road. If you’re feeling like a bit of an adventure, Sullivan Falls is located just down the road and is accessible with a 3-minute hike through the woods. If you want to find out more about Big Run Falls and Sullivan Falls, check out my write up of both waterfalls. Getting to this vantage point takes effort, but Springfield Falls is a great destination for waterfall lovers that hate hiking. Springfield Falls is tucked away on the edges of State Game Lands 284 in Mercer County, PA. While it’s not visible from the small dirt parking area, it can be heard from there. The top of Springfield Falls is located only about one minute from the parking area. And, while there isn’t a trail per se, the area is quite open with very little ground cover. If you want to see Springfield Falls from downstream, simply walk a bit further along the creek. While the ground is a bit uneven, it’s not difficult walking. It’s worth noting, however, that getting down to the falls can be quite difficult, even for experienced hikers. Fortunately, the view from the top is quite lovely. For more information, check out my article about how to get to Springfield Falls. Paint Falls might be one of the ugliest waterfalls in Pennsylvania, but it’s quite easy to reach. In the past, I’ve called Paint Falls the “ugliest waterfall in Pennsylvania.” And, while I still think that might be true, it is also an easy-to-reach waterfall and is still worth visiting if you love the look and sound of falling water. Located in the heart of downtown Paint, Pennsylvania, Paint Falls can be reached with a very short, but very steep walk down a small access road behind a church. Parking is located directly at the top of the hill, and you can be from your car to the waterfall in less than two minutes. I’ve seen photos of Paint Falls that have been selectively zoomed or edited to look quite nice, but the abandoned trailer, piles of trash, and large metal piping next to the waterfall make this one a bit rough around the edges. However, I’ve yet to visit a waterfall that I didn’t enjoy visiting, and Paint Falls is no exception. For more information about getting there, check out my full article about how to get to Paint Falls. Want to see more waterfalls in Pennsylvania? 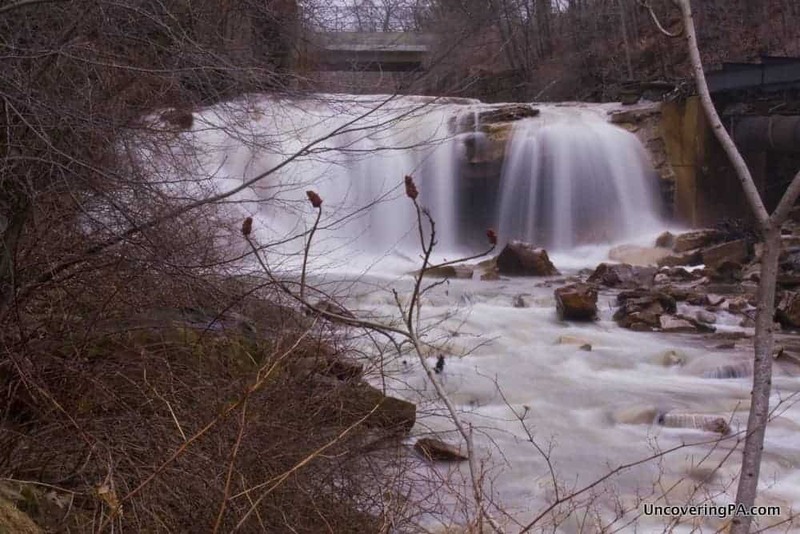 Check out the roadside Hinkston Run Falls. You can also visit our Pennsylvania Waterfalls page to see visit recaps and recommendations for dozens of waterfalls around the state. My wife and I look forward to seeing some of these beautiful places in Pa.
Have visited/hiked several of your choices . Thanks for sharing. I think you mean “people who use a wheelchair.” Personally, I don’t like to hike, and I don’t use a wheelchair, so the ‘hate to hike’ is ok with me. One more graphic please. A state map with ten numbered names which are hot links to your full articles, would help me easily locate, make a excursion plan and research the details for a weekend or day trip. If you venture to Dingman’s Falls, you should go a bit further and visit George W Childs Recreation Area. There are 3 waterfalls, all accessible by a loop trail, as well as some interesting ruins on site. The first waterfall is actually accessible by wheelchair! Good to know, Kathy. Childs Recreation Area has been on my radar for a while, but I haven’t had a chance to visit yet. Hope to soon, though. Hi, I an trying to find a place that I visited a long time ago that was an old closed down marble factory. There was waterfalls and some of the structures were still up, but no museums, just informative signs. We found it by accident, just driving from NC. Dies this sound familiar to you you? It was beautiful. I would love to return to it. That doesn’t sound like anywhere that I know of, Judy. Do you know what part of Pennsylvania it was in? Nay Aug Falls in Scranton’s Nay Aug Park is highly accessible. Back in the 80’s as a reporter, we had to climb down an old trailer, these days there are steps, and even a bridge across it. Back in my reporter days someone would always be getting hurt diving off the rocks into the pool below the falls and rescue workers would have to get them out. I never heard of these, can’t wait to head out this summer! I love your coverage of PA. You seem to balance east, central, and west PA. You provide handy tips and useful information (directions). I also learn a lot from others’ comments. So happy I fell upon this site! Keep it coming. Thanks so much, Kathy. I’m glad you found the site, too. Balancing content for the various regions of the state is something I try really hard to do. I’m glad it’s working. Just started exploring PA last summer and hiking in general. Now I’m hooked! That’s great. Enjoy your explorations. Recently retired & purchased an RV, which makes me so grateful I found your posts. 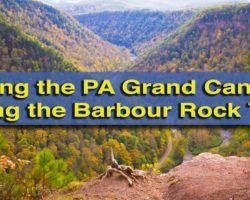 I am a PA native and can’t wait to explore more of my home state thanks to your info. Is there a map just showing where all these waterfalls are? All of the waterfalls featured on the site are listed here: UncoveringPA.com/Pennsylvania-Waterfalls. For each individual one, you can find out how to reach them by clicking the links at the end of the descriptions. Blakeslee Natural Area has a nice waterfall. It’s about a 1/2 mile walk on a pretty flat trail though couldn’t do it with a wheelchair. It’s also really close to I-80. I used to stop there just for a simple, relaxing break during drives from Poconos to Philly. 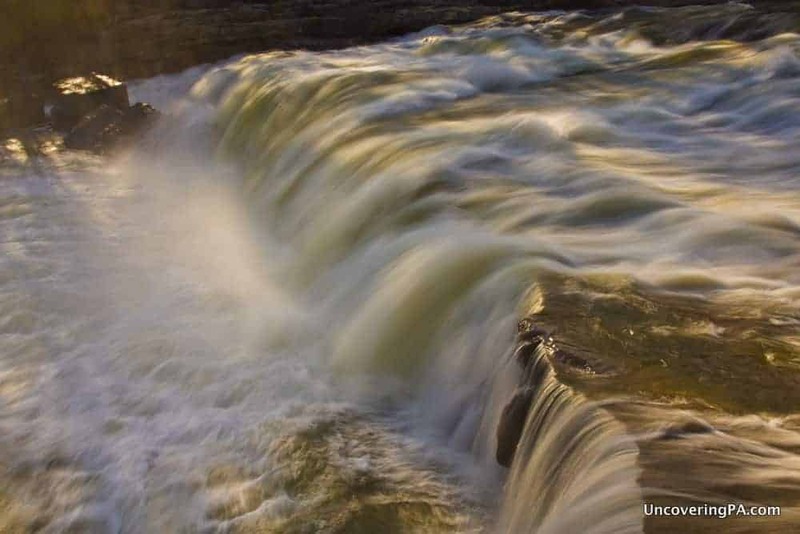 It is a great one, and I’ve written about it previously (https://uncoveringpa.com/how-get-tobyhanna-falls-austin-t-blakeslee-natural-area). It’s a bit too far of a hike to qualify for this particular article, though. Add Bear Creek Falls to the list. The falls is visible upon exiting the car. 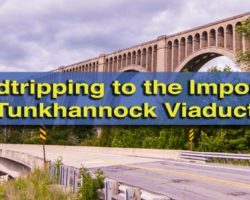 I visited and written about it here: https://uncoveringpa.com/visiting-buttermilk-falls-luzerne-county-pa. I could add many more waterfalls to this list, but decided to cap it at 10 for now.